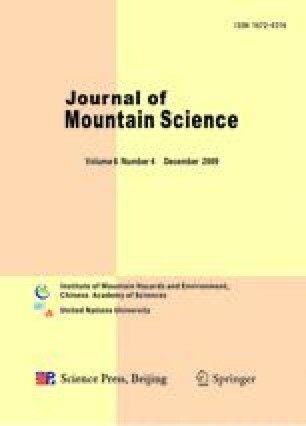 Surface morphology of soil cracks is one of the important factors influencing the water evaporation rate in cracked soil in Yuanmou Dry-hot Valley Region, Southwest China. Quantitative study of the complicated surface morphology of soil cracks is a prerequisite for further studies of soil-cracking mechanisms. The present paper establishes a quantitative indicator system by application of concepts and methods originating from Fractal Geometry and Network Analysis. These indicators can effectively express the complicated features of soil-crack network structure. Furthermore, a series of values related to soil-crack morphology was obtained by image processing on field photos of soil-crack quads, and gradation criteria for the degree of development of soil cracks were determined. Finally, the changes in values of the morphological indicators under different degrees of development were analyzed in detail. Our results indicate that (1) the degree of development of soil cracks can be divided into five grades, i.e., feeble development, slight development, medium development, intensive development and extremely intensive development; (2) the values of the indicators change predictably with increasing degree of development of soil cracks. The area density (Dc) increases, and both the area-weighted mean ratio of crack area to perimeter (AWMARP), which reflects the intensity of cracking, and the index r, which is related to the connectivity of a soil crack, grow uniformly (albeit with different forms). AWMRAP increases at a geometric rate while r shows logarithmmic growth, indicating a gradual increase in the connectivity of a soil crack. Nevertheless, the area-weighted mean of soil-crack fractal dimension (AWMFRAC) shows a decreasing trend, indicating a gradual decline in the complexity of cracks as area density increases.